In order to get the most out of Google+, you should look for co-workers, colleagues, and other interesting professionals to follow. Google+ allows you to organize the people you follow into Circles. Circles let you easily customize with whom to share your posts and other information when using Google+. In this Day 2 challenge, you will find some people to follow and add them to a new Circle. IMPORTANT TIP: When looking for people to follow and add to your Circles, check below their picture. 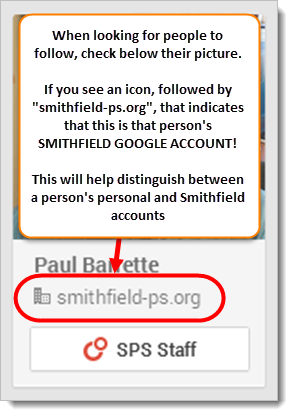 If you see an icon, followed by "smithfield-ps.org, that indicates that this is the person's SMITHFIELD Google account. This will help distinguish between a person's personal and Smithfield accounts.